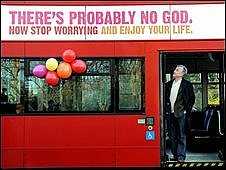 An atheist UK bus campaign which uses the slogan "There's probably no God" does not breach the advertising code, a watchdog has ruled. The Advertising Standards Authority said it had assessed 326 complaints. Some claimed the wording was offensive to people who followed a religion. But the body concluded the adverts were unlikely to mislead or cause widespread offence and closed the case. The £140,000 ad campaign was launched by the British Humanist Association. The Advertising Standards Authority (ASA) said it would not be further investigating any complaints about the campaign, which was launched on British buses and the London Underground on the 6 January. While some of the complaints claimed the adverts were offensive and denigrated people of faith, others challenged whether they were misleading because the advertiser would not be able to substantiate its claim that God "probably" did not exist. However, the ASA ruled the adverts were an expression of the advertiser's opinion and that the claims in it were not capable of objective substantiation. The adverts, with the slogan "There's probably no God. Now stop worrying and enjoy your life", were launched earlier this month following fund-raising by the British Humanist Association. Featuring on 200 bendy buses in London and 600 other vehicles in England, Scotland and Wales, they were backed by high profile atheists, including Professor Richard Dawkins. Last week, Christian bus driver Ron Heather, from Southampton, Hampshire, refused to drive one of the buses carrying the atheist slogan and walked out of his shift in protest.